The end of the year brought with it the end of an era as I said goodbye to the first car I ever purchased! It might be a bit hard to believe, but I've only owned four cars in my life, and my parents gave me the first two. It wasn't until the second one of those died in the summer of 2002 that I bought my first car at the age of 27. I had already decided that I wanted a small SUV, so it wasn't too difficult to decide on a Ford Escape as my car of choice. In the spring of 2011, Kevin's car was totaled in a car accident. At that time, it made more financial sense to buy me a newer car, so I opted to buy another Escape and Kevin took over driving the 2002. Sadly, he didn't love it quite as much as I did, and he's been counting the days until he could replace it with a car of his choosing. As old cars often do, this one was quickly turning into a money pit and when another large repair was going to be required we decided it was time to bid the old Escape adieu. 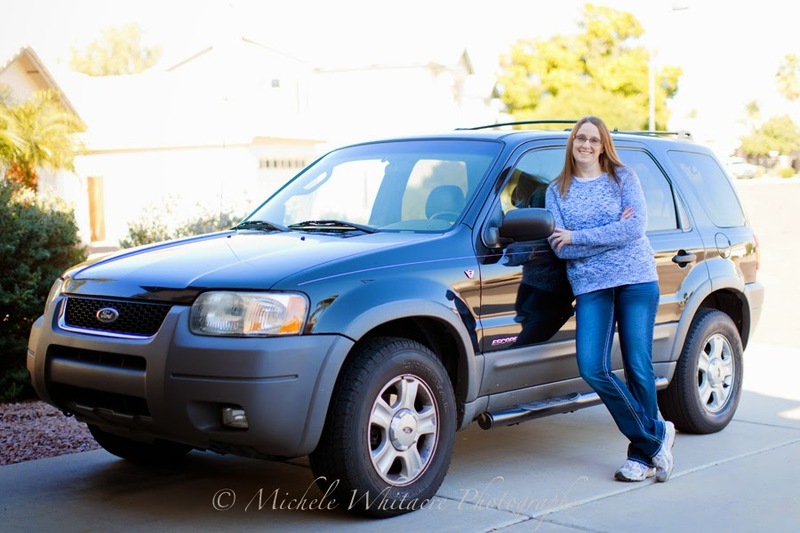 So while Kevin has been doing a happy dance over shopping for a new car, I have been feeling a bit weepy and nostalgic over getting rid of my first big girl car. Twelve years is a long time to own a car! I can't help but look back over the past 12 years of my life and reminisce at where I was when I purchased it and everything I have been through since then. That car has seen me through an amazing number of adventures and HUGE life changes! Even though I haven't been the one driving it the past few years, it was still sitting there in the garage so I could say hello whenever I wanted. Since we wanted to keep the miles off the newer vehicle, we usually took the older one whenever we went any place together. So, I really hadn't said goodbye to it when I bought my new one. But it appears the time has finally come that I must do just that. So, goodbye my dear old friend. Thank you for safely taking me through the journey of my crazy life these past 12 years. I will definitely miss you! I have only owned 3 cars. The one I have now, I bought it when it was brand spanking new. I've had to put a lot of money into it the last few years, but I can't afford to buy another one. I graduate in May, and don't see myself being able to get another one any time soon afterwards, what with a mortgage and student loans to pay. But when the time comes when I have no choice to replace it, I know I'll be really sad. My car has seen me through a lot of good times and bad too.